Dungeons were invaded by malefic monsters. 3 Friends, a swordsman, an archer and a wizard specialized in monsters's extermination will try to clean all thoses dungeons. But a sword, an arrow or a spell cast won't be able to exterminate so many monsters... For that, those friends have imagined dozens of differents powerful traps. In each dungeons, only one hero will have the possibility to enter and to put the traps needed to defeat all the monsters. It will be your mission to chose the hero, to put traps in the dungeon. 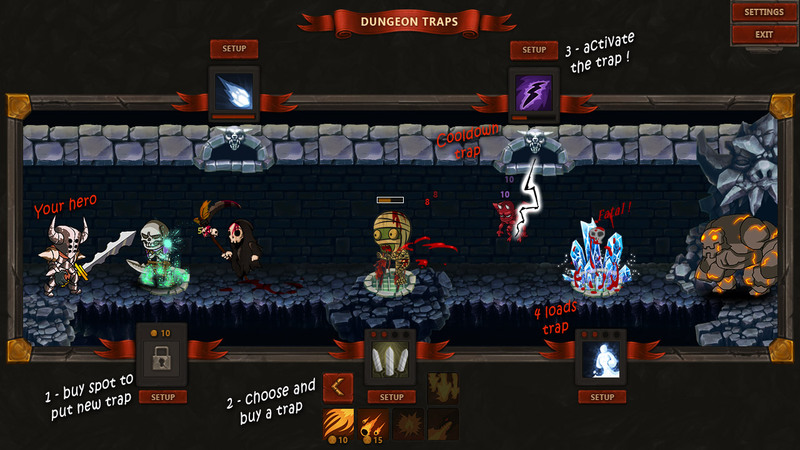 As in a tower defense, you will be able to chose between dozens of different traps, but in Dungeon Traps, you must activate the traps when the monsters is at the good place. 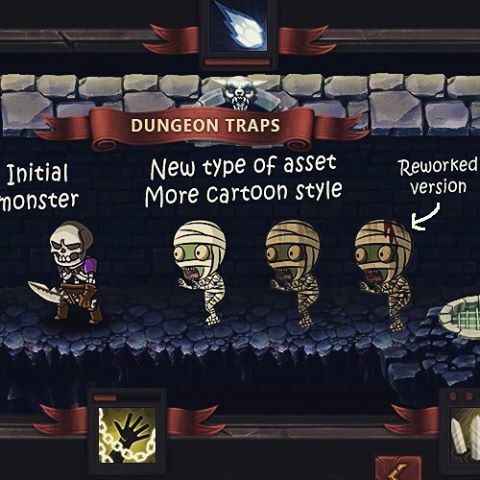 You can change traps during the game and adapt it to the monsters who enter in the dungeon. Choose carefully between the traps and don't let the monsters killing your hero ! 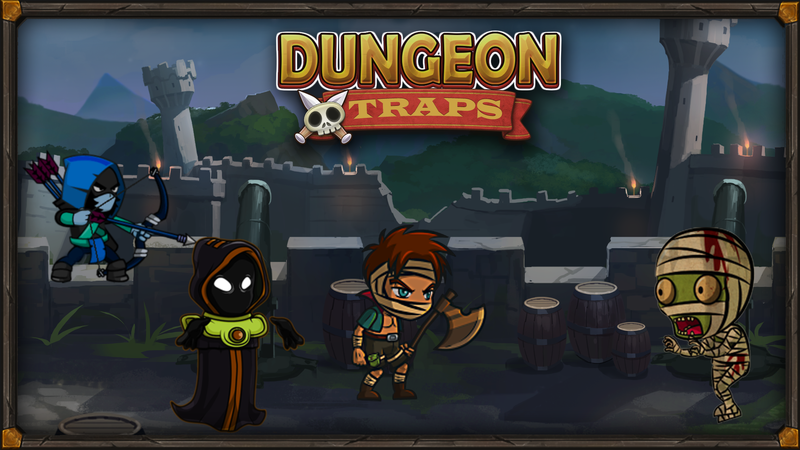 Each dungeon finished will give you money and some drafts to create new powerfull traps. 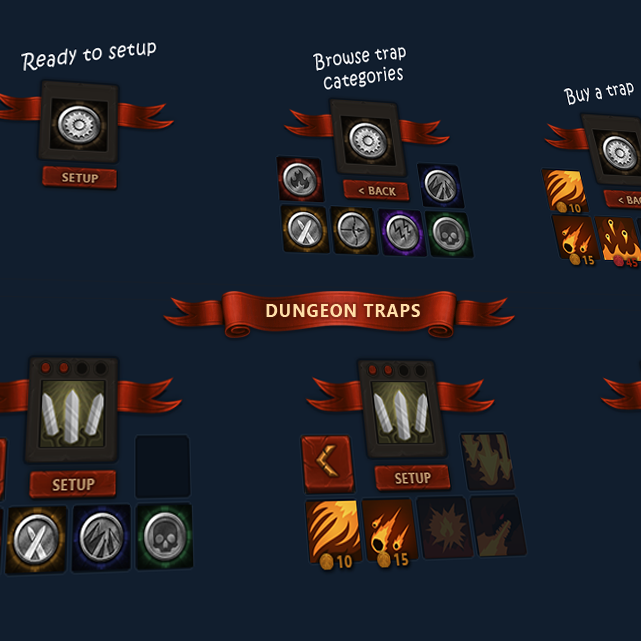 This pictures are from the Alpha release of Dungeon Traps. 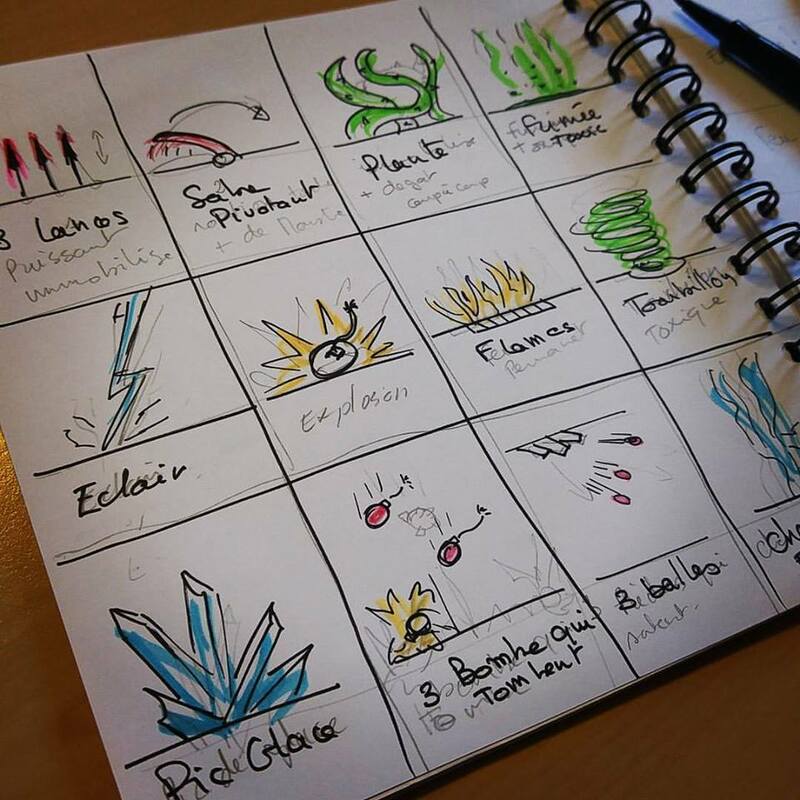 Thanks to follow this gameDev project ! This projected is planned to be launche on Steam. Gameplay evolution, What is the best choice for you? In Dungeon Traps, there is for each traps two buttons, one to buy and setup the traps, and one to activate the traps when monsters is bear. Some of players who tried the game ask me why there is two buttons instead of only one to buy and activate the game. It's clear that it could be more easier to play on it with only one big button. In fact in my idea, I plan to let player the choice to change the traps during the game. You bought a fire traps and during the game, you see a new monster coming, one who don't care about fire. So youhave the possibility to buy a new traps at the same spot. It's why there is two buttons. On an other way, as a level won't be longer that 3/4 minutes, I can choice to have only one button, considering that there is 7 spots for traps we can inmagine that players have to choose to keep some spot free in case of a new monster come during the game. So what do you think about thats ? I will take care of what players thinks about that to have a better game. I published a patch for the alpha demo, correcting few bugs and adding a small screen tutorial. You can try this first alpha version of my game which is fully playable.